The New Ultra Efficient Linis Professional RO systems from Chester Paul Company offer a recovery range of 75-65% with less than 50% flow rate loss over the life of the element. Cadmium, Chromium III, Chromium VI, Lead, Selenium and Arsenic. This system has been tested for the treatment of water containing pentavalent arsenic (also known as As(V), As(+5), or arsenate) at concentrations of 0.050 mg/L or less. This system reduces pentavalent arsenic, but may not remove other forms of arsenic. 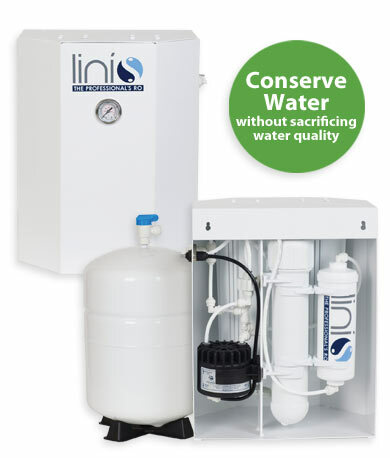 This system is to be used on water supplies containing a detectable free chlorine residual or on water supplies that have been demonstrated to contain only pentavalent arsenic. Treatment with chloramines (combined chlorine) is not sufficient to ensure complete conversion of trivalent arsenic to pentavalent arsenic. Please see the Arsenic Facts section of the Performance Data Sheet for further information.